My husband and I used to cook together a lot. When we were still living in different apartments, with different flatmates, and in different towns that was one of the highlights of our weekend. We also used to bring a lot of food to parties. Mostly dessert. And we were probably a bit snobby about our food. Of course our cakes were the best! And our tiramisù, nobody could make a better tiramisù. Then I became vegan, started a blog and made myself in charge of baking. At the beginning there was a lot of trial and error, but still people were positively surprised when they tried the cakes and cookies I took to parties. Tiramisù was a completely different thing though and at the beginning I had no idea how to veganise it. There were no vegan ladyfingers, there was no vegan mascarpone. I dreaded the idea of putting tofu in our signature dessert. Our expectations were high. One day I finally found the right kind of ingredients and the result was a tiramisù both P and I were happy with. It’s funny that in the end not the filling but the sponge cake recipe was really tricky. I was obsessed with the perfect recipe, light and fluffy and suitable for jelly rolls. (That didn’t work out, by the way.) Back when I made the recipe for my tiramisù sponge I thought chickpea flour was the perfect egg replacer and that it had to be the solution to a perfect sponge cake. Today I know that chickpea flour is great and has its advantages. But I also try to develop simpler recipes. I already had a very simple tiramisù variation in my Christmas e-book. I just left out the sponge there and used spekulatius cookies. But for tor this summery version I went back and made my own sponge cake. Super easy and no fancy ingredients at all. 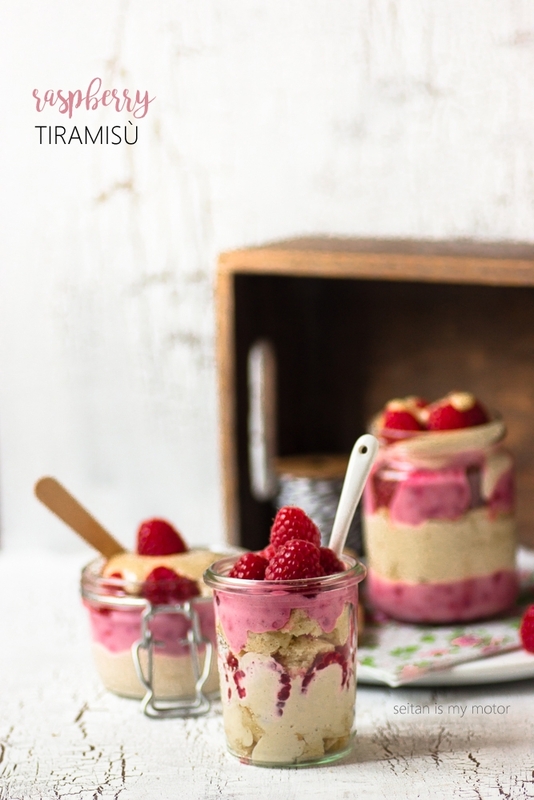 I put the tiramisù in jars of different sizes and sometimes I started with the plain filling, sometimes with the raspberry one, and sometimes I just started with the cake layer. I baked the sponge in a 8 x 8 inch pan and of course there were leftovers after I cut out the dough circles. I tore those leftovers apart and used them in the last two jars. You can probably see that in one of the pictures. In the end I had more filling than cake and couldn’t fit it all in my jars. But I am pretty sure you’ll figure out how to solve that problem! You can eat these after they have set in the fridge after 1-2 hours but I recommend to let them rest for at least 12 hours, so the flavours can blend better and the mousse will set a bit more. It will be a bit creamier and firmer that way. To make the sponge cake, line a 8 x 8 inch square pan with parchment paper. Preheat the oven to 160°C (320°F). In a bowl, combine flour, baking powder, salt, and sugar. Combine soy milk and vinegar and let sit for 2-3 minutes. Add soy milk mixture and oil to dry ingredients and whisk until the batter is free of any lumps. Pour into the pan and bake for 16 minutes, or until an inserted toothpick comes out clean. Transfer to a cooling rack, remove parchment paper, and let cool completely. To make the filling, place yoghurt, cashews, oil, powdered sugar, optional rum, and lemon juice in a blender. Blend until smooth. Remove half of the filling and place in a small saucepan. Add frozen raspberries. Bring to a boil, stirring often. Cook for one minute, stirring constantly. Using a round cookie cutter that has about the same size as the jars openings, cut the sponge cake into rounds. Place 2-3 tablespoons of either the white or the pink filling in your jar and top with sponge cake. Place a layer of the second filling on top and add another layer of sponge cake. 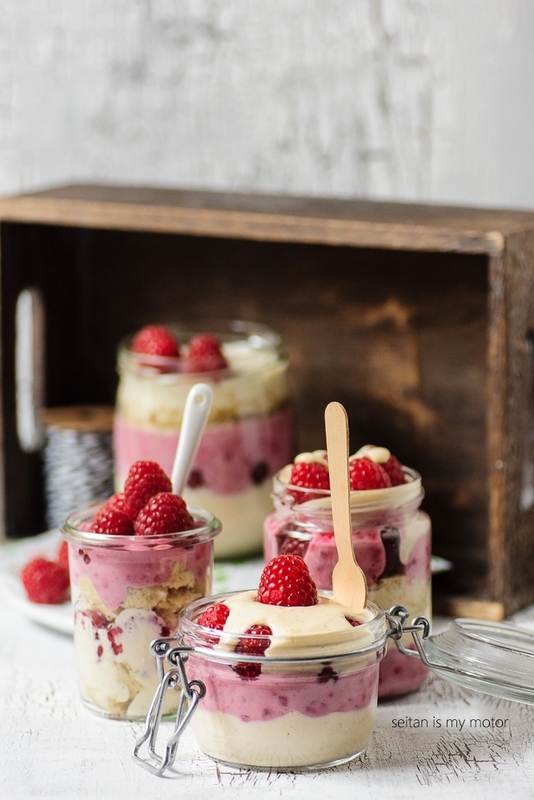 Place a couple of fresh raspberries in the jar and cover with more filling. Place in the fridge for at least an hour, recommended are at least 12. 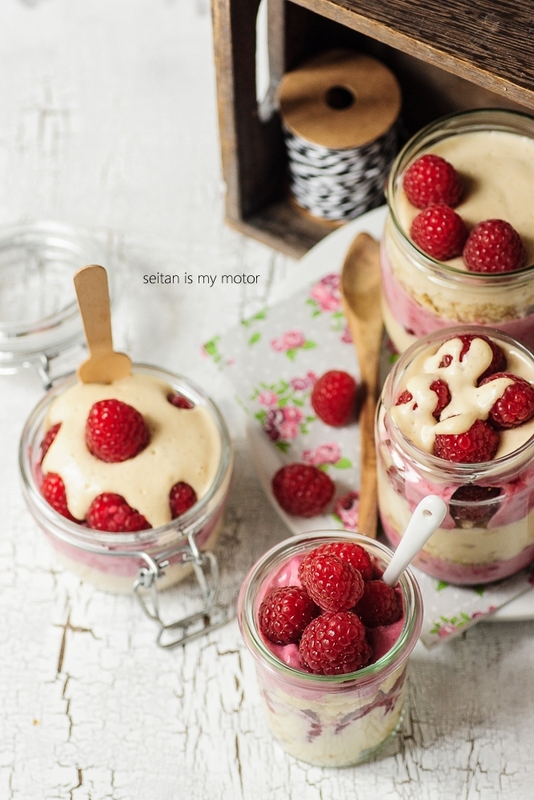 Hi Mihl, This recipe looks fantastic. Do you think I can sub coconut oil for margarine (as it is cheaper and I guess it must have more or less the same texture)? Plus, I often wonder in US recipes – but I know you live in Germany – if I can sub cashew nuts mixed as a cream for store-bought soy cream (a bit similar to soy creamer for coffee as american vegans use – as I know soy cream or any vegan cream doesnt exist in north america) and maybe stil add aguar or guar powder? In France, I have access to a nice soy cream “soja du chef” (brand: Bonneterre) and you can even whip it to get a crème fouettée/chantilly. What are your thoughts on this subject? The coconut oil has different properties, it hardens better and faster. The texture might be softer with margarine, but I can’t say for sure. I didn’t really get what you wanna do with the cashew cream or soy cream? Do you want to use soy cream instead of cashews? That would change the texture completely and make the filling very liquid. Have you access to whipable cream? Maybe use that instead. But honestly, these are very substantial changes and might result in a completely different result. Oooh… this looks great! I love the idea of tiramisu, but coffee and alcohol don’t agree with me. A yummy berry version sounds much more appealing. I think vanilla should be fine! But I’d think about reducing the powdered sugar. I’ve never used coconut yoghurt in a baking recipe and I think it would definitely change the flavour. Let me know what you decide!